Federico Macheda took just 25 minutes to become a legend. His goal against Aston Villa in April 2009 was the cathartic explosion that propelled Manchester United to their 18th league title, equaling Liverpool’s long-standing record and answering what now seems a very ill advised banner. This being Old Trafford, Sir Alex Ferguson and Manchester United, the goal came in stoppage time, completed a comeback and obscured what was otherwise a worryingly poor performance. Conventional wisdom holds that Macheda’s strike – which, if you’re like me, you watch on YouTube about 25 times a day – confirmed that United’s youth system had life after Giggs and Scholes and that Ferguson wasn’t turning into a big-spending, modern football capitalist after all. Although this view is prominent on Manchester United forums, it is more than slightly dubious: Federico Macheda is not in fact a Manchester native. (Yeah, I know: I was fooled, too). Macheda started his footballing career at Lazio, a club known for, among other things, its association with Fascists, Mafiosi, where he was noticed, and later poached, by United’s efficient scouting network. Needless to say, the Italians weren’t best pleased. “We tried in every way to stop Manchester United from taking away our player but it was not possible to do anything,” club president Claudio Lotito said after the Aston Villa game. “We could not compete with United’s offer.” You can only imagine what was going though Lotito’s mind when Macheda scored another winner the following weekend, deflecting a speculative Michael Carrick drive into the back of Sunderland’s net. So what was painted as a story of United’s commitment to academy talent was actually an example of a big, powerful English club taking advantage of Italian regulations that prevent young players from signing professional contracts. If all this sounds cynical, bear in mind that this writer was so convinced by the hype that he bought a “Macheda #41” jersey for the 2009/10 season, not bothering to wait for the release of the official squad list, which confirmed rumors that Macheda had been upgraded to #27. Mind you, it was probably a mistake to buy a Macheda jersey at all – season 09/10 didn’t treat him very well. A niggling injury and an inevitable drop in form confined Macheda to just five league appearances in his first full year as a first teamer. He scored just once, at the end of a cameo appearance: a consolation goal that turned out to be a handball. The following season featured the first of Macheda’s two disastrous loan spells, a six-month stint at Serie A’s Sampdoria. Macheda started well enough, scoring a decent goal in the Coppa Italia, but he soon lost his place to the workmanlike Massimo Maccarone, nicknamed “Big Mac” by the ever-creative Italian press. Sampdoria were relegated, and Macheda returned to Old Trafford with his tail lodged firmly between two increasingly unproductive legs. So last year, when Macheda failed to make any kind of impact during a loan spell at QPR, no one was particularly surprised. The fact that Mark Hughes only played him three times in the league, and that Bobby Zamora was the guy starting in his place, just added extra humiliation to an embarrassing decline. Now, if you believe Sir Alex — and, personally, I don’t — Macheda still has a future at Manchester United, because he’s young, talented, fit, potentially brilliant, a hard worker, a great presence in the dressing room, a promising youngster and a good lad. In reality, Macheda plays for a club that also employs Wayne Rooney, Javier Hernandez, Dimitar Berbatov (though probably not for much longer), Danny Welbeck and, maybe, Robin van Persie. At best, Macheda will be United’s fourth-string forward next season, wheeled out for the occasional Capital One Cup match and, if he’s lucky, in the dying minutes of comfortable wins over Wigan. At worst, he’ll be stuck cleaning RvP’s boots. So where did it all go wrong? When did Macheda stop being a superhero? In truth, he never actually was one. While the goal against Aston Villa was evidence of talent, it offered no compelling reason to believe that Macheda was capable of scoring consistently for Manchester United. Any player can produce a solitary moment of magic; only a select few can produce one every week. Tempting as it is to say that Macheda bought his own hype, became complacent and stopped working hard, the cause of his frustrations is more likely the continued excellence of Danny Welbeck. Over the last two seasons, Welbeck has gradually usurped Macheda’s Promising Youngster role, not because he’s humble – see cocky celebration versus Derby County for proof that he’s not – but because he was always the better player. With Sir Alex spending money on big-time strikers like Rooney, Tevez, Berbatov and Chicharito, the United front line will only ever have room for one youth product. Danny Welbeck is that one. 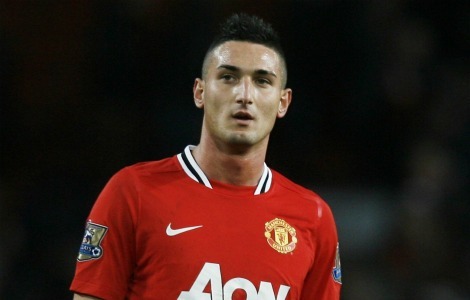 Macheda is currently participating in United’s latest marketing – I mean, pre-season – tour. He even scored the only goal of their opening match, a 1-0 victory over AmaZulu. So far, he’s looked sharper than Chicharito and less sullen than Berbatov. But his star has certainly fallen. Everything Macheda does is shadowed by thoughts of what he could be doing if had lived up to his potential – and, believe me, those hypothetical exploits are a lot more exciting than deflected winners against mediocre South African teams. This season could be Macheda’s last chance. Sir Alex is more patient, especially with young players, than his critics would have you believe — but he was doubtless disappointed by the disastrous QPR loan. For some players, loan deals are crucial stepping-stones; for Macheda, they’re just extensions of the suffering he endures in Manchester. This season, Ferguson will surely keep him at Old Trafford, the scene of his only triumph – and the place where the slow death of his celebrity seems most starkly apparent. Agree with all of your article except for the comment that he’s a hard worker. When you look at players that don’t make it at Old Trafford, they fall into two categories, assuming that they are still performing at a decent level.. Either their work-rate isn’t there (Berbatov, Veron,) or they don’t listen anymore (Gibson, Beckham). Rumor has it that Macheda falls into both of the above which is a shame because I think he has talent. Not everyone makes it at OT.